My question is: how to perform calculations in \foreach variables. I've simplified your code a bit. I think you're thinking too much like a brick-layer adding the mortar as you go along. I fill in the mortar at the end. %% the code in these next two lines to remove that effect. %% The second draw prevents bricks from sticking out of the sides. %% differently for odd and even layers of mortar. I've color-coded the parts of the diagram. There are several reasons for this. First is that I want to be able to see what it is that I'm doing. This makes the different parts stand out. Only for the final finished product will I remove the color as I did above. If you comment out the following lines, you can see this. Also, by naming the colors for each part, you make it easier for yourself weeks or months later when you want to tweak the castle but don't quite remember what each part of the code does. You could put in comments; always a good thing. But, naming the colors this way also helps you see what is supposed to be happening in each part of the castle construction. Also, just in terms of computations, I prefer to work with integers over decimal because then I have more control over the precision and need to worry much less about round-off errors and the like. If you're going to scale like this, though, you need to be aware of what exactly is being changed. So, you should probably read up on this in the TikZ manual. Any rigidly defined lengths are not going to be rescaled. There is also a scale key which you might find useful too. This is a step toward using relative coordinates which can ultimately make your picture much more amendable to future modifications. Also, I believe the ++(<coordinate>) notation makes much clearer in the code what it is that you're doing. But that's probably just personal style on my part. %% establish various position of the picture relative to the "corner stone"
%% for the tower:          "tower top right"
%% for the fences:         "fence top right"
%% for the bricks:         "brick"
%% for the castle body:    "castle top right"
%% create a background that's not necessarily the same color as the mortar. One important point to notice here is that I produce the bricks and mortar all at the same time (much as my maligned bricklayer mentioned above). But, I don't want to have to think too much about where to begin and end this laying of bricks, so I use the scope environment and clip feature of \path to create a presentation of just the portion of the bricks I want visible (remove the clip and you'll see the full force of what I've drawn). Additionally, I've added a few variables for things such as brick width and brick height and then calculate \xmax and \ymax. 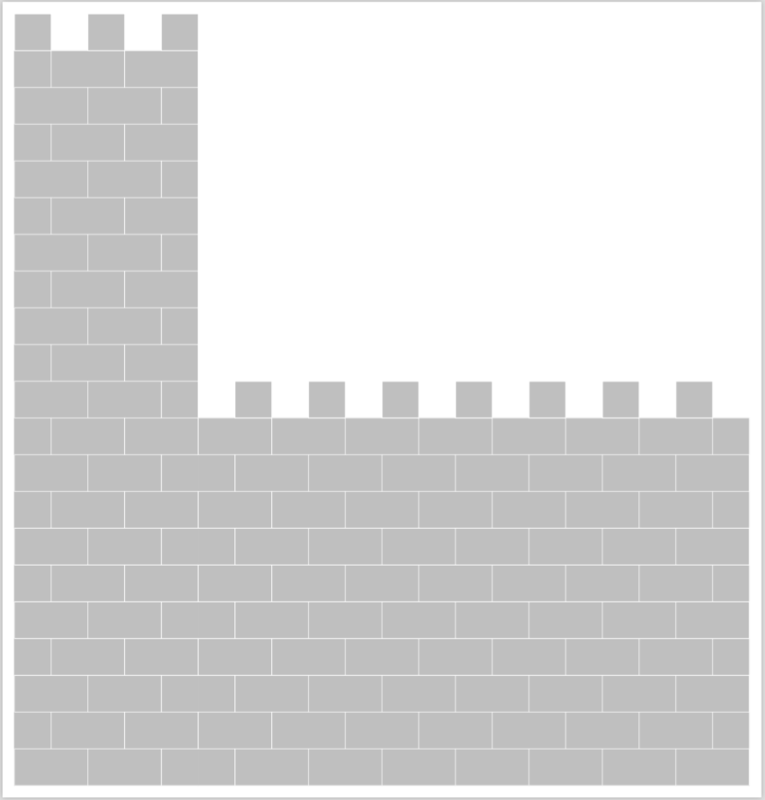 This provides another layer of flexibility in case you want the bricks to have a different dimension. 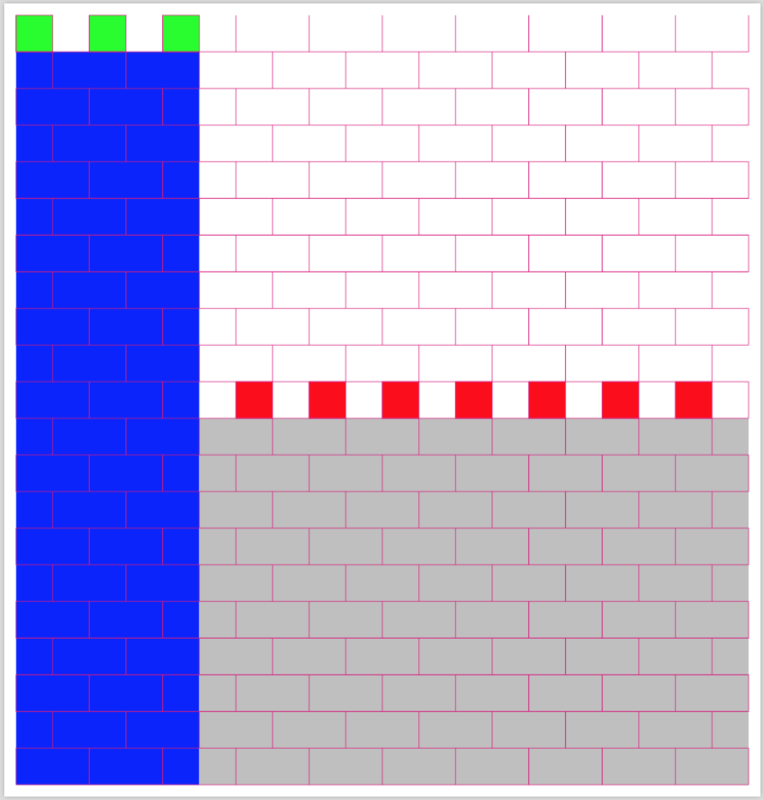 For example, in this image I've made the bricks have dimension 3x2.